Grand Banks is well known to anyone interested in cruising powerboats, the brand moniker, Dependable Diesel Cruisers, has been associated with trawlers, and our lifestyle, for decades. Even the most passionate sailors recognize the profile and traditional appeal of a Grand Banks. In the occasional rift between sailors and powerboaters, a Grand Banks is readily accepted by both camps. Since launching the first GB back in 1963,American Marine has built thousands of boats in yards in Hong Kong, Singapore, and, more recently, in Malaysia.They can be found in harbors around the world, all sharing familiar lines from Ken Smith&apos;s original design.And there is also their very successful Eastbay series, high performance cruising yachts that today comprise half of current production. Life&apos;s been good at Grand Banks. But before we get too complacent with the American Marine story, let me state that it is anything but static. In fact, a lot is going to change. Hold on to your traditional hats, folks, because the new millennium is here, and Grand Banks has no intention of being earmarked as an old timer, a classic cherished only by antique lovers. 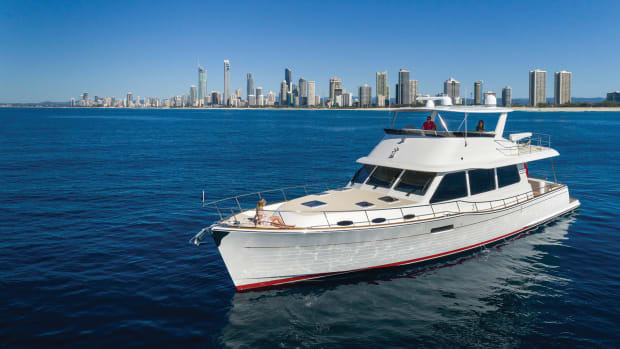 We were invited to come to Singapore to sea trial GB&apos;s new pilothouse boat, a flagship of major proportions that Grand Banks hopes will bring the company into the new century. It is definitely going to do that. But I doubt the men and women at Grand Banks counted on just how far the project would take them, or how much momentum it would generate across the entire production line. It is some boat, and some story. First off, how about a little name change to get things started: American Marine is no more. The name of the company was officially changed in 1999 to GrandBanks Yachts Pte Ltd., which is more in keeping with the Grand Banks line of boats it builds. This change coincided with the move to new facilities and headquarters from Singapore&apos;s Jurong Town to Loyang Crescent, in eastern Singapore.The new yard employs some 350 people and builds the larger boats in their lines: the GB46, GB52, GB66, Eastbay 49, and now the Aleutian Class 64. The Aleutian Class 64 is the first raised pilothouse yacht coming from Grand Banks since the Alaskan series of the late 1960s and early 1970s.A result of many requests from GB owners and dealers for a pilothouse model, it also reflects the company&apos;s interest in building a modern cruising yacht capable of efficient higher speed. "What we were really trying to do here," said Bob Livingston, chairman of Grand Banks Yachts,"was to have a flagship. Our owners were ready to go to a raised pilothouse boat, but we didn&apos;t have anything to offer." In the past they&apos;d considered such a boat but instead proceeded with developing the Grand Banks 58. Unfortunately, the luxury tax put an end to that before it went very far. "This time around, I decided that we&apos;re going to build a raised pilothouse boat, and we&apos;re going to do it right. So we sent out our guidelines of about 25 different parameters to four naval architects. Much of it came off the old Alaskan series, such as that flaired bow, and we also wanted to go at least 20 knots." The design nod went to Tom Fexas Yacht Design of Stuart, Florida. "We really liked working with the Fexas people. They were easy to work with," Bob added. And what also happened came as a surprise to everyone. The project brought up new ideas and construction techniques, and the GB organization quickly saw opportunities to rethink their approach to boat building. "This one boat is really changing Grand Banks," he told us. "From a fiberglass construction viewpoint, from a sound level viewpoint, even the way we do our windows will benefit from this boat. On the other Grand Banks we still have teak window frames, but that will change. "We had to move. You get so comfortable in your niche, and you don&apos;t move forward as fast as you think you should. But we must." The ideas that Fexas brought to the table are not going to change the distinctive GB or Eastbay image, but rather fit inside the existing GB profile. Not different-looking boats, but built differently: lighter, more high tech, more sound and vibration deadening, and more headroom in engine room spaces. "It sounds ridiculous, but even the fabric we use on this boat is new for us," Bob explained. "We just never did that before. Exotic fabric is totally not us. But I think we&apos;ll be going in that direction now." When I asked him if Grand Banks was getting in touch with its feminine side, Bob laughed but quickly agreed. "That&apos;s right," he said with a smile. "That&apos;s exactly right." The first Aleutian 64 is already causing prospective buyers to form lines for this and smaller versions of the series, so one might say they hit their mark. Walking around the Loyang yard, Y.P. Wong, who heads production at Grand Banks Singapore, shared his thoughts as he showed off the small facility. Loyang is one-sixth the size of the old Singapore yard, as all manufacturing of hulls, decks, and parts for all models moved to the other Grand Banks facility in Malaysia. "We know we needed to develop ourselves for the next millenium," Y.P. said. "That is why we looked to Fexas and his team. "We&apos;ve been doing things the same way for the last 30 years. It is time to change." New teak decks are now glued to the deck, rather than screwed down with hundreds of holes drilled into each deck surface. Epoxy bedding adhesive does a better job, making for less future maintenance, as long as modern vacuum bagging is used to get the job done right. Without all the holes, plywood deck coring can be replaced with much lighter balsa core. And plywood bulkheads can be replaced with synthetic and honeycomb coring for stronger, more rigid, yet lighter bulkhead structures. On a Grand Banks 52, for example, using such core material for the deckhouse instead of plywood results in a weight savings of over 1,200 pounds-and that&apos;s just in the deckhouse! There is no guarantee that every GB model will benefit from these improvements, but each will be considered over time. "We&apos;re looking at cored bulkheads and cored soles for all boats," Y.P. told me. Even on the 64-foot Aleutian model, over 100 changes have been noted for Hull No. 2. Each day brings a renewed energy level to a crew with 30 years of experience building Grand Banks. "The boat business is slow to change," Y.P. said, "yet the Aleutian Class has been a driving force of change at Grand Banks. "Our lamination schedules have not changed for 10 years. That is just one example of how we&apos;re looking at our processes with fresh eyes. We&apos;re maintaining the same amount of fiber but changing the weave and orientation, as well as achieving a more optimum glass-to-resin ratio." Part of these changes come directly from the Fexas team, while others were the result of industry consultants whose expertise was sought during the initial stages of the Aleutian project. In terms of ergonomics, the AC 64 also brings a fresh look at the way things are done at Grand Banks. Interior and flybridge seating is designed to be more comfortable than on all previous models, a direction inspired by a professional interior design firm, a first in GB history. "We&apos;ve been criticized over the years that we make the most uncomfortable seats in the world," Bob joked. "This boat has made us more aware of the problem, and we&apos;ve really worked hard on this boat. It will be changing everything, both in the interior and the flybridge. "It opened up our horizons," Bob told us of his experience with A La Mer, the Fort Lauderdale interior design firm engaged for the project. "It really made a difference. "We wanted to get a feminine viewpoint on this new boat, and the ladies at A La Mer are good. We&apos;ve learned a lot, and they helped take us to the next level." It may take some time, but clever trim ideas and design flairs in interior cabinetry will likely trickle down to the rest of the fleet. Y.P. Wong agrees completely with Bob&apos;s assessment. "Things are more exciting around here," he added. "It is not as routine as in the past, as we&apos;re not just building boats on schedule as we have for years. "We want to modernize the traditional GB interior," Y.P. went on, "and the Aleutian is the first boat in this new direction." Koay Yin Koon, engineering manager at the Singapore yard, thinks the use of newer materials is reshaping the company. "I&apos;ve been here for 30 years," Koay explained. "And I really enjoy seeing changes that are progressive, making boats that are lighter and high tech. "It&apos;s an exciting time to be a part of Grand Banks." We spent a day at Grand Banks Malaysia, a short distance away from the Loyang facility. The Johor Bahru yard in Malaysia has expanded from our first visit several years ago (see PMM, Fall &apos;98). The continued expansion at Grand Banks Malaysia enables them to manufacture all parts used in the assembly of all boats, from hulls to propeller shafts, teak wheels to fuel tanks. It&apos;s all done in Malaysia, and the larger hulls are towed to Singapore for completion. The Malaysia workforce will expand from 700 to 1,000 when the yard reaches full capacity. Michael Benton, technical manager at GB Malaysia, and Mohidin Pitchai, quality control manager, gave us a walking tour around the yard. I saw the huge molds of the hull and deckhouse of the Aleutian Class and visited the shops and floor locations that produce the parts that go into it. The place really hums, young men and women working hard to keep current production (100 yachts this year) on schedule. The Malaysia visit is quite a contrast to the small Loyang facility, which assembles the big boats. Watching the line of boats coming together in Malaysia, I think it&apos;s fair to say the Eastbay series was actually the first step in this changing corporate evolution. They are truly high performance cruising machines, every bit as capable as their older sisterships but lighter, built with modern materials and technology. The Aleutian has simply taken that further. The hull, according to Tom Fexas, is a refinement of his "round V" hull form, used in many of his designs. The shape has a deep forefoot, incorporating a lower spray rail to keep the boat dry. The full, deep keel protects the propellers and resists yawing in following seas, and there are two shallow propeller "pockets" in the hull to reduce draft and allow a better shaft angle. While the boat was designed to go 20 knots, Fexas made sure the hull would have outstanding performance at slower speeds as well, since many owners may be more conservative in speed when they go cruising. The hull bottom and lower topsides are solid fiberglass, while upper topsides are cored, as are deck and deckhouse. And rather than relying on sheer bulk to give the boat strength, Fexas designed six foam stringers to go into the hull, supported by four transverse bulkheads. It is stiff construction that uses the latest in fiberglass and core technology. Let&apos;s go aboard Hull No. 1 of the new Aleutian Class 64. The side decks on this cruiser are wide and well-protected, with a minimum width of 18 inches at deck level. With headroom of 6&apos; 7" on the covered side decks, bulwarks angle out to increase that width to 22 inches, and a high stainless steel railing completes the protection. Side decks and foredeck have molded nonskid, as teak decking is reserved only for the covered aft cockpit. Walking forward to the foredeck, I found it easy to move around the boat. It&apos;s user friendly, compared to some boats that somehow are more awkward. Even the handrails are within reach, rather than down at knee level. The generous flair of the bow translates into a huge foredeck, and stepping out from behind the high Portuguese bridge, I had to remind myself that I was on a Grand Banks. It sure isn&apos;t like any other GB I&apos;ve been on! The bow is 10 feet off the water, but one must really stretch out beyond the flaired bow to see the waterline. Back aft, there is a ladder on the aft cockpit up to the boat deck and flybridge, but I doubt I would ever use it. There is much better access through a stairway inside the boat. Also, this ladder is almost vertical, which most builders have moved away from. Climbing ladders is just not the way to go for older adults. The covered aft cockpit is a cozy spot for enjoying the world at anchor. Wide seats are built against the transom, and a small door in the transom opens down to the swim platform. One particularly clever feature is in addition to a wide lazarette hatch in the center of the cockpit. One of the transom seats lifts up to uncover steps down into the lazarette and engine room. I like this feature a lot, as the steps are spaced nicely for big feet, and there is no need to get down on hands and knees to climb down into the machinery spaces. The flybridge is set back, about midships, and visibility to the bow and sides is marvelous. The social potential of the flybridge is clear on this boat, as large, molded-in seating will accommodate quite a large party. Not to mention the obligatory icemaker and wet bar. A single Stidd helm chair is located behind a raised console large enough for all electronics. Unlike the older GBs, this helm was designed for today&apos;s electronic toys, and both the size and angle of the console should satisfy even the most electronics-happy skipper. Behind the flybridge is a wide boat deck. Richard Ahl, senior R&D manager for the AC64 project, explained the boat deck was designed for a 13&apos; 6" RIB. A stainless steel deck crane handles a heavy tender, yet folds down out of the way. On the forward end of the aft cockpit are two massive, lovely Freeman doors that slide open into the saloon. These doors are serious, expensive, and close with the resounding clunk of a maximum security jail cell. As I said, lovely. Once inside the saloon, the first impression is that Grand Banks really has gotten in touch with its feminine side. Flying in the face of GB tradition, there is plush carpeting on the sole. Real carpeting, not just a throw rug over teak and holly. Most of the boat&apos;s flooring is covered with designer carpeting, a first in GB history. But the feel of sophistication doesn&apos;t stop there. Raised panels on all cabinetry and Corian counters on all horizontal surfaces give a more contemporary feel to the boat. It is elegance without excess. With a headroom of 6&apos; 7" throughout, the saloon measures 15 feet long by 13 feet wide. Large windows begin approximately 36 inches off the sole, so visibility is good standing or seated. My walk around the saloon had me thinking about wide body layouts-a large expanse of living space, enough to really live aboard without stepping over each other. But wait a minute...this is not a wide body layout, as there are side decks on both sides of the saloon, generous ones at that. Not sure how they did this, but obviously a result of the Fexas design. The 19&apos; 9" beam may explain it. Overall, the interior is definitely "designed," a far cry from the all teak, masculine interior of a traditional Grand Banks. This first boat has a entertainment center on the port side of the saloon, but I&apos;m told most owners prefer a window over the large cabinet. A gently curved settee with firm cushions stretches forward on the port side, and the angled back cushions offer maximum comfort. The settee ends at a bookcase that separates the saloon from the galley. There is 16 inches of open space above the bookcase, so visibility is good in all directions, and the interior feels light and open. On the starboard side of the saloon will go two large chairs and a small table, once the boat is delivered to its new owners. Up three steps from the saloon is the galley, dinette, and helm. The galley is a classic Ushaped affair, fitted with Corian counters that are 36 inches high and a double Corian sink. On Hull No. 1, there is a set of overhead cabinets over the four-burner Miele electric range. These cabinets, which were a specific requirement of the owners, are 26 inches tall and really separate the cook from the saloon. Future boats will have cabinets that are shorter, perhaps closer to 20 inches. This galley includes a convection microwave oven, three Sub Zero units (two fridge, one freezer), and a trash compactor. The sole in the galley is teak and holly, which makes sense, and across from the galley is the curved stairway up to the flybridge. The gasketed door to the flybridge measures 24 inches wide by 5 feet high and is set at about a 35-degree angle. Transporting a tray of drinks or gourmet goodies up to the flybridge couldn&apos;t be easier. Very nice indeed. Just forward of the galley counter is an interesting feature I find creative and functional. Unlike other raised pilothouse boats, which offer a bench settee for guests while under way, the AC64 has a dinette opposite the inside helm, just forward of the galley, well within reach of the galley counter. I see three positive benefits of this design feature. First, there is a dedicated dining area in the boat, with comfortable seating for four or five. In addition to an outstanding view, there is no need to have plates balanced on knees in the saloon. Second, there is comfortable seating for everyone while under way. Guests and crew can watch the world glide by, read a book, or chart a course within feet of the helm, but not from a vantage point of behind-helm seating that sometimes resembles riding on a bus. Lastly, the dinette and its position is perfect as an impromptu desk for writing letters, working on a laptop or playing a card game. While some may question this integration of pilothouse and galley, it is worth considering that few will drive this boat long distances around the clock. The absence of bulkheads translates into terrific visibility from the inside helm, which is raised some 30 inches above the saloon and brings in lots of light for an airy, contemporary interior. Unless I really planned overnight passages, with strict watch schedules and night vision requirements, this layout makes a lot of sense for realistic, real world cruising. I can easily imagine running this boat up through the passages of British Columbia, or connecting the dots along a tropical island chain. I did not expect to like this layout as much as I do. It really works. The helm features a traditional, beautiful teak wheel, Stidd helm chair in matching color to the interior and an angled console well suited to a full complement of navigation electronics. There are drawers and overhead cabinetry for auxiliary switches, alarms, and instrumentation. A single Freeman sliding door opens from the helm out to the Portuguese bridge on the starboard side. Down a wide set of steps next to the helm brings us below to the staterooms. On the Aleutian Class 64, they did not try to cram the maximum number of cabins into the bow. Indeed, just the opposite. Separating the boat&apos;s two staterooms is a common area and office. The area is 9 feet square, and the staterooms are located at opposite ends of this space. The common area has a locker with full-size Asko washer and dryer, a long settee with drawer storage under, a cedar-lined hanging locker and a day head. There is also a good-size office desk on Hull No. 1. The open space is perfect to separate the staterooms for privacy as well as provide additional open space for extended living aboard. Were it not for the dinette next to the helm, I would feel right at home working in this office, which is a far cry better than a cramped make-up table tucked into a corner of the owners&apos; cabin. Headroom is a minimum of 6&apos; 4" in the common area, and there is carpeting throughout the accommodations. Aft of the common area is the master stateroom, located under the galley and helm. It is simply huge by any standards, measuring 9 feet long by 15 feet wide. With the common area taking care of washer, dryer, and other spacehogging essentials, the master suite has plenty of space for hanging lockers and storage galore, and even comes with a cedar-lined walk-in closet. The queen island berth is flanked by matching bureaus, each with six large drawers. I don&apos;t think I own enough clothes to fill this stateroom. Three opening ports (8" by 18") bring in light to the master stateroom, which on Hull No. 1 is tastefully appointed in teak, Corian, plush beige carpet, and ivory overhead. Moving back through the common area to the bow is the guest stateroom. Extending 11 feet forward to a watertight bulkhead, the V-shaped cabin also has a raised queen island berth, which is surrounded with drawers and shelves. The stateroom also has its own entertainment center, two cedarlined hanging lockers, and full ensuite head with separate shower. Headroom is 6&apos; 6" in the guest stateroom. The accommodations in the Aleutian Class 64 are obviously designed for full-sized people actively involved in full-sized cruising and living aboard. The engine room on the Aleutian Class is as much the heart of the boat as on any GB- except in this boat, the pair of Cat 3406s take up a lot of space. 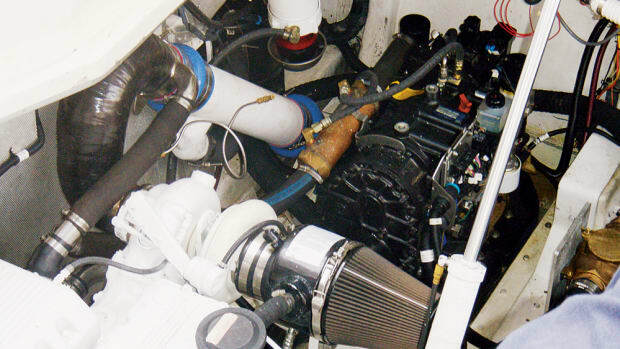 Access around these inline six-cylinder engines is fairly good, so much of the hydraulics, batteries, air conditioning, and other systems are placed outboard of the engines. Two large, aluminum alloy fuel tanks are in front of the engines, as is fuel management plumbing. Total fuel capacity in the 64-footer is 2,238 gallons. The engine room has just under 6 feet of headroom and measures over 14 feet long by 17 feet wide. While that may sound like one big cavern, the required systems on a large luxury cruising yacht do their share to fill up the space. Such as dual Onan gensets. A dogged, watertight engine room door on the aft bulkhead leads into the lazarette compartment, a useful utility room that has over 6 feet of headroom and includes a workbench, drawers for parts, a freezer, and most of the ship&apos;s electrical system. Inverters and house batteries will be much happier here than in a hot engine room. As mentioned earlier, there is a 24-inch by 28- inch center lazarette hatch, but normal access is wonderfully easy with an angled, five-step stairway down through the hinged aft cockpit seat. I like this feature a lot and wish more boats were as well-thought out. The first Aleutian Class 64 is headed for Southern California, and it was just being finished when we toured Grand Banks Singapore. We were aboard during one of the sea trials, and I walked around the boat as she was pushed to her limit in the Straits of Johor. Running at full throttle (2,300 rpm), the boat hit 21.9 knots, quite a thrill in such a big yacht. Surprisingly, it did not seem quite so fast from inside the pilothouse, and I measured sound levels while we barreled down on a tanker bound for some distant fuel depot. I recorded the following: saloon, 80 dB; master stateroom, 79 dB; common area, 76 dB; forward stateroom, 75 dB; pilothouse helm and galley, 76 dB. What intrigued me is that when we later slowed down to 2,000 rpm for a more conservative 16.5 knots, the sound levels actually went up by a full decibel in those same areas. The GB engineers concur with this observation. I learned that the Fexas and GB engineers are still evaluating Hull No. 1, to better understand the source of all measurable vibration and airborne and structural noise in the new boat. Just being quiet is not good enough, and I saw a great deal of enthusiasm in these men when they talked about vibration analysis in its various forms. Perhaps this too results from shifting from traditional boat building to the creation of sophisticated, high tech structures. At the time of our visit, the GB engineers were studying the boat&apos;s exhaust system, and especially the tip of the underwater exhaust cowl, to see if they could further reduce its transmission of vibration. In their initial research, they had measured a vibration frequency that precisely matched the engine pulses at high speed. But since the engines are so well isolated and run so smoothly, they believe the engine pulse vibration may be transmitted by the exhaust system. Pretty cool stuff, and it will no doubt result in an exceedingly quiet yacht. The Aleutian Class 64 is a big boat, definitely in the upper end of our niche. But its presence affects a greater number of us, as the project has changed Grand Banks. I predict the Grand Banks line of tomorrow will be traditionallooking cruising boats that are no longer traditionally built. These people have seen the future, and they love it. I&apos;m not sure what they&apos;re going to do with that Dependable Diesel Cruisers thing, however. It may have fit a line of boats from yesteryear, but it&apos;s a vast understatement for today&apos;s Grand Banks. Perhaps it would be better to speak of sophistication, comfort, luxury, quality, tradition, and technology. Those words describe today&apos;s Grand Banks, and where the company is going. Welcome to a brand new day.